Pelican Post is a specialist literacy charity dedicated to the distribution of appropriate children's fiction to schools and supporting charities in Africa. Our mission is to inspire and educate young minds in Africa by providing a channel that links schools, NGO's, charities, authors, publishers and governmental departments together to help raise awareness of the significance of reading fiction in school classrooms. We believe storytelling in classrooms is not only key to improving literacy uptake rates and driving down poverty but also invaluable in terms of developing a child's own imagination, aspirations and sense of self identity and net worth. Working with numerous charity and publishing partners we are dedicated to delivering brand new sets of appropriate children's fiction so that teachers can practice shared classroom reading and children can discover the joy of reading. 1. 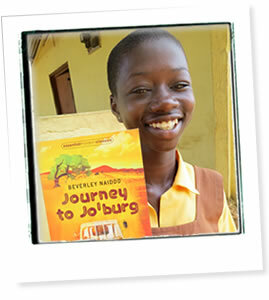 To facilitate greater access to appropriate children's fiction in schools and partnering charities working in Africa. 2. To faciltate the printing and distribution of appropriate children's stories in local languages. 3. To specifically identify support and promote reading initiatives that provide young girls with positive role models. 4. To provide training support and raise awareness to teachers on the importance of reading fiction in classrooms. 5. To provide a voice to unpublished or aspiring African authors and illustrators especially those advancing childrens fiction. The books are all in English and are culturally appropriate for African children. Considerable effort and thought has also gone into drawing up a final selection of proposed reading books with each of the project's partners, authors and international publishers as well as the local communities we work with. One of the charities main goals is to get many of the early readers translated and printed into dual language especially in regions where there are currently almost no reading materials readily available. Although we deliver books throughout Africa from north to south, west to east, we currently limit the number of schools and charitable organisations we work with to those with whom we have developed a working relationship, who have already established long term reading initiatives and who have expressed a direct interest of becoming involved. As a result, we are able to closely monitor progress as to the number and type of books received within our target schools and understand the impact the books have. The scheme was launched in July 2009 and is the brainchild of Nick Johnson, who was initially inspired to do something to help literacy in Africa following his personal experiences of working in a school in Uganda with Raleigh International. Several years later and following a chance meeting with Anita Roddick, Nick subsequently put his idea into action whilst undertaking a self expression and leadership course run by Landmark Education in London. The Pelican Post Project is not supported or affiliated with any religious or political organisations. We are simply an online community with an ambitious goal to see what difference we can make to an identified group of communities through the internet. To help us achieve our objectives, we have sought advice and support from a number of charities involved in the distribution of books and in raising education and literacy levels in Africa. For more information on the partnering charities please visit our links page. Education and literacy have long been identified as key factors in making poverty history. Through the power of the internet, schemes like this could potentially inspire a million+ people to support and donate the cost of sending a book (only £2.50!) and really impact on the future of many children's hopes and aspirations. Why the Name "Pelican Post"? We have chosen the Pelican as the symbol for a number of reasons. Firstly, the Pelican - despite often being associated with coastal regions - is widespread throughout equatorial and sub-Saharan Africa and in many areas can frequently be seen on inland lakes, river banks and other waterways in central Africa. Secondly, it seems to be a fitting metaphor for our postal project. Pelicans are one of the largest and heaviest birds on the planet. Yet despite their size and bulk, they are still able to travel great distances to search for new fishing and breeding grounds. It may take them some time to get there but wherever there is fish to be found, they eventually settle. Like the Pelican, our project aims to have a spectacular impact by eventually delivering thousands of books to every corner of Africa. The more individuals involved in the project, the greater the impact in raising literacy, hope and imagination for an innumerable number of lives. The Pelican Post is a charity and limited company registered in England and Wales. Charity No. 1142143. Company No. 7584679.